I've been talking a lot about hand creams lately, and I want to point out one that I'm really taken with. Not only is it super affordable at around $5, it works great on your cuticles too. I've gotten really bad at biting my nails and the skin around my nails, making everything on my hand look like total crap! I guess it's some sort of nervous habit I have. I tend to do it at a lot at work while I'm stressing, so nothing works better then Curel Hand & Cuticle Cream. My husband even asked me a couple weeks ago if I had anything for dry cuticles. I searched my entire stash, and realized that I have nothing for cuticles. Wow. So when I saw Curel made a cream especially for your cuticles, I had to check it out. This leaves your hands smooth and extremely soft. It doesn't have a particular fragrance, it smells kind of like that "lotiony" smell, which I really like. After only 3 days of use, my cuticles were looking SO much better. With the change of weather here in Arizona my hands not only get dry but I get blisters and cracked skin. It's really gross. Curel never leaves your hands rough or greasy, it's great for healing and repairing bad skin. Now I just need something like this for my face. Strangely I think this lotion has helped my nails as well. They seem stronger and tougher to bite, which is good for nail biters. Maybe it's in my mind, but it's encouraging me not to bite the skin and cuticle around my nail. So if you're guilty of this like I am Curel is a good place to start. 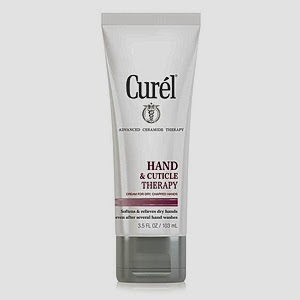 If you do a lot of chores around the house or do rough work with your hands, Curel Hand Therapy is a must too. Nothing is more un-attractive then a girl with "rough hands" At least that's what my husband says! Curel Hand & Cuticle Cream is available at a local drug store near you for somewhere between 5-$8 dollars depending where you are. If you have perfect hands and nails, then you probably don't need this, but if you struggle with rough, dry cracked or just plain yucky cuticles, this is a must have. Disclosure: A press sample was sent to me for consideration from PR for the purpose of this review only. All opinions are my own.